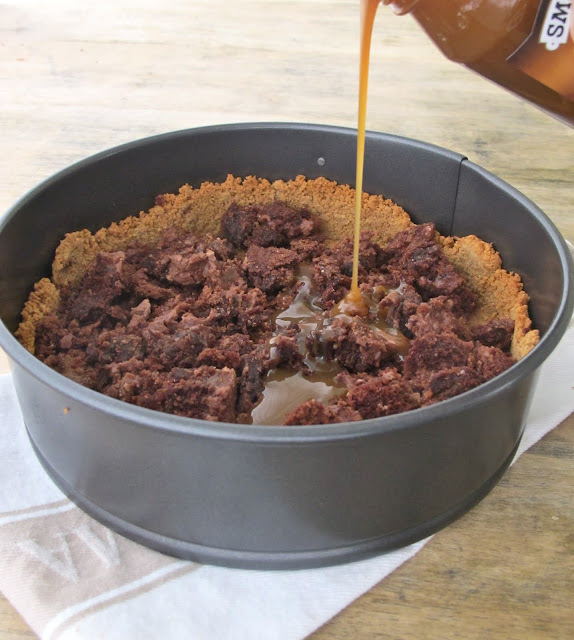 Jenny Steffens Hobick: Caramel Brownie Cheesecake | National Cheesecake Day! Caramel Brownie Cheesecake | National Cheesecake Day! My very first job was at The Daily Grind in Lexington. It was sort of a gourmet coffee, bakery and cafe - homemade desserts, muffins, stuffed croissants, and handcrafted cappuccinos and lattes. Pretty fancy for a small town! At least, I thought so when I worked there in high school. One of my weekly duties was to make the cheesecakes. Now you must understand, that this was in the 90's right in the midst of the Cheesecake craze. The Cheesecake Factory was just becoming the hot date spot amongst my friends (that had boyfriends who could drive...), the Jell-O Nobake Cheesecake was the most popular dessert at potlucks... cheesecake was the dessert. When I learned how to make this Cheesecake, this Caramel Brownie Cheesecake, I remember thinking that it was a really big deal. It was something special. Somewhere along the way, Cheesecake had lost its status in my recipe repertoire. It had fallen victim to cupcakes, tiramisu, molten cakes, and gourmet brownies. Maybe it was the countless pieces I would eat during my days at The Daily Grind? Maybe the Jell-O Nobake "Cheesecake" had ruined my taste for a real cheesecake? A couple of months ago, we ordered a dessert platter that featured a slice of cheesecake among 3 other desserts. As the table passed the tray and sampled each slice, everyone would say, "Oh the cheesecake is amazing." I agreed. I had forgotten how good a real piece of cheesecake could be. So, in honor of National Cheesecake Day, I prepared the infamous cake of cheese that started it all for me, The Daily Grind's Caramel Brownie Cheesecake. Prepare the crust by breaking the graham crackers into crumbs by hand or in a food processor. Melt butter and stir into graham crumbles with a fork. Pack the mixture into a springform pan packing half way up the sides. Bake at 350 degrees for 8 minutes. For the filling, in a mixer, whip together cream cheese and sugar. Add eggs, sour cream and vanilla. Crumble the brownies into the cooked crust, then drizzle with the caramel sauce. Pour cream cheese filling over the brownies and caramel. Bake at 450 for 20 minutes, then lower oven to 250 and bake for 1 hour and 15 minutes. Allow to sit at room temperature for 1-2 hours, then wrap and refrigerate for 4 hours - overnight. Pour in graham cracker and butter mixture. I use a glass to pack the bottom and the sides. A measuring cup also works great. Whatever you have around! For my "Brownie Leftovers" I used leftover Chocolate Sheet Cake baked in a Pie Dish from earlier this week. Yay! I didn't eat the entire thing! 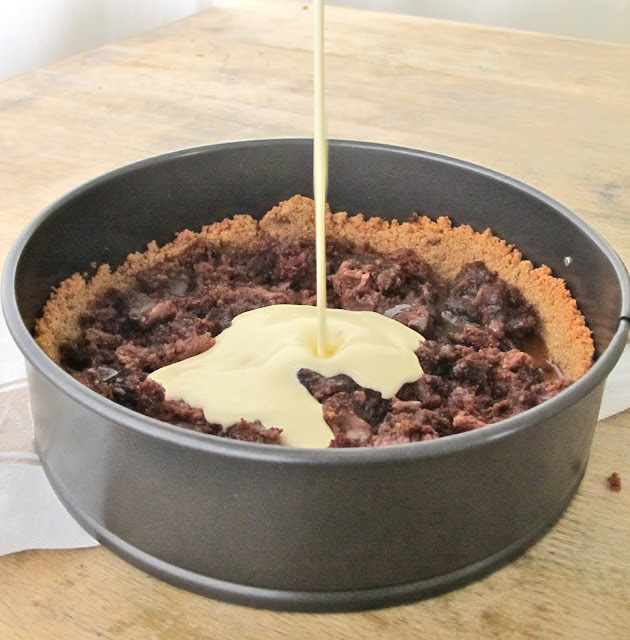 Crumble the brownie/cake with fork, then put it into the crust. I like big, chunky pieces of brownie/cake in the cheesecake. Pour in cheesecake mixture. The pan will be pretty full. I like to bake it on a baking sheet in case it over flows. Welcome back, cheesecake. I've missed you. I found your blog through Pinterest.com. This looks amazing! I can't wait to try this recipe. This looks fantastic and very doable! Thank you for sharing it with us! This looks so delicious!... but I don't have a cheesecake pan. Is there any way I could do it in a pie pan or a square pan?